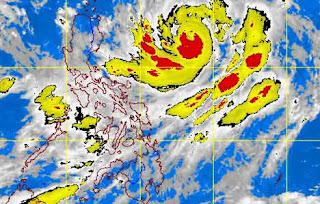 State weather bureau reported that Typhoon Odette gained more strength and moving closer towards Northern Luzon, as of 5 pm, Thursday, September 19, 2013. - PAGASA. According to PAGASA hourly update as of 3 pm, Typhoon Odette was located at 590 km East of Tuguegarao City. PAGASA forecaster Buddy Javier said, "Ang bagyong si Odette lalong lumakas habang kumikilos palapit sa Northern Luzon." PAGASA raised public storm warning signal no. 1 in 7 areas in Luzon, such as, IIocos Norte, Ilocos Sur, Mt. Province, Ifugao, Abra, Kalinga, and Isabela. While 5 areas in Luzon also raised public storm warning signal no. 2 by PAGASA, such as, Batanes Group of Islands, Cagayan, Calayan, Babuyan Group of Island, and Apayao. The Sea travel is risky particularly in the seaboards of Occidental Mindoro and Palawan and over the eastern seaboard of Central and Southern Luzon and of Visayas. For the meantime, please bookmark this page now or visit this site more often for you to be updated. You may also share this post to your friends so they may know about Typhoon Odette Update, September 19, 2013. Comments or suggestions about "Typhoon Odette moving closer towards Northern Luzon, Thursday, September 19, 2013" is important to us, you may share it by using the comment box below.